Dell’s M-Series blade solutions offer simplified management, server consolidation and flexible network scalability in a shared infrastructure to reduce the cost and complexity of managing your server infrastructure. Blade servers offer lower operating costs per server compared to rackmount servers, as well as lower power consumption, lower airflow requirements, and reduced and simplified cabling. M-series blade servers range from Dell’s 10th Generation to the 13th Generation, ensuring your investment is protected and you can upgrade your blade servers as your application demands change. 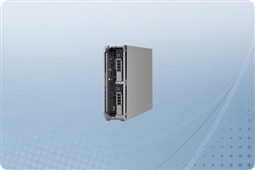 Dell’s M-Series blade solutions start with the M1000e enclosure. A 10U enclosure, the M1000e shared infrastructure includes up to six hot-plug, redundant power supplies, up to nine hot-plug, redundant Energy Smart fans and one (redundant optional) Chassis Management Controller (CMC). The M1000e enclosure holds up to sixteen half-height server blades or eight full-height server blades. Up to three fully redundant interconnect I/O fabrics (Ethernet, Fibre Channel, etc.) are supported simultaneously within the enclosure through up to six interconnect I/O modules. Half-height server blades options at Aventis Systems include the M520, M600, M610, M620, and M710HD. Full height blade servers include the quad-processor M820 and the ultra-scalable M710. Aventis Systems offers standalone blade server options for ultimate server-by-server customization, as well as populated M1000e chassis with a variety of interconnect options for a complete M-Series blade server solution. 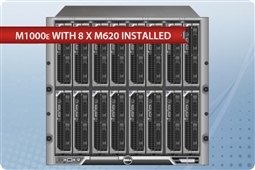 Please browse our selection of M1000e and M-Series blade servers below. Are you looking for shared storage for your blade servers? Please consider our selection of Dell NAS and SANs.